So pleased to hear that Mr E is back home and on the mend, even if it means adapting to a new ‘normal’ – he can’t fail with you at his side! Love those lines from the poem and I can see the word ‘Remember’, although subtle, in the felt. Subtle is quite apt, isn’t it? It makes you look closer and therefore take it in more. 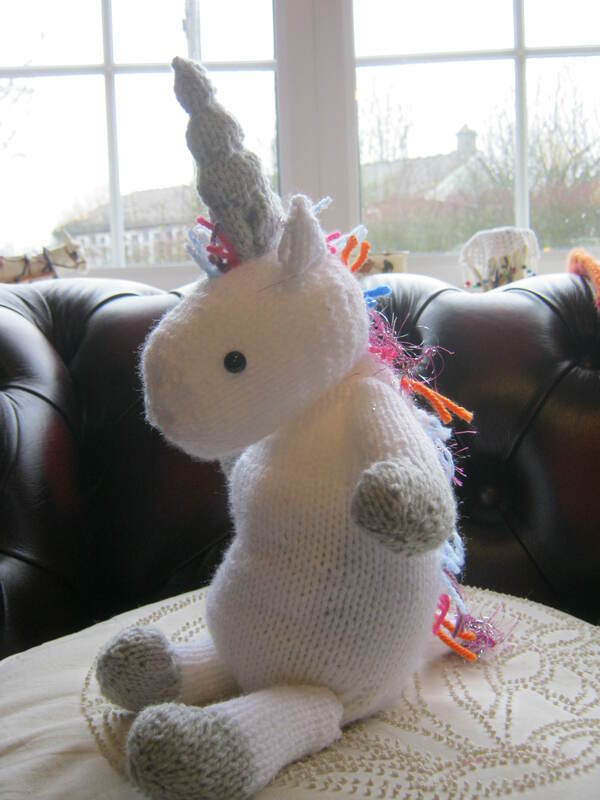 Love the unicorn, to sweet, and your knitted Sunday Scarf is going to be lovely. You sound great–like the weight of the world is lifting! I’m just loving the sweet unicorn, whatever her name is. I, too, only eat chocolate . . .
You are right the weight of the world does feel as if it is lifting. Maybe the unicorn is callled Kerry. Apparently she is still refusing to speak, I blame the postal service. The postal service can be traumatizing, I’m sure! And I’m sure her name will be far more exotic than Kerry, although it tickles me to think I could ever share a name with such a beauty! Glad things are looking up for you. The heart is lovely, I would add seed beads too. Thank you, I shall give them a whirl. Oh we did, it was such lovely weather. I’d use a stronger coloured thread and then it’s definirely readable. Love the felt. Glad to hear Mr E is home and recovering well. I love your tile, it’s beautiful, inspiring me to make a start on a hydrangea coloured blanket, I’ve had the wool for a couple of months now! Your heart is beautiful, I would be inclined to embroidered with a darker thread, maybe even a purple to match the purple lower down. I shall have a hunt to see what other thread colours I have. 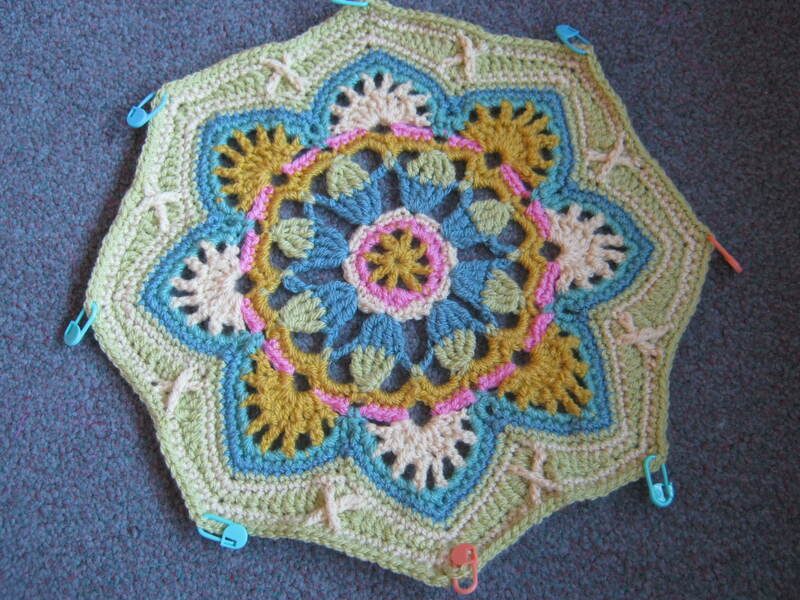 The Hydrangea blanket sounds so pretty, I shall look forward to seeing it. So happy to hear the Mr is getting better. Sunshine helps so many things. The unicorn is delightful! Who wouldn’t be happy with one of those. I love the sweet soft colors of the heart as well. Hope everything shapes up to lighten your load. Little helpers are always nice. Still praying for Mr E’s recovery. :o) As we age, if we are under the weather, it seems the only time that “time” slows down! Having everyone under the same roof is always comforting! Yesterday was finally Spring for us! We had snow all last week. I am a winter person so I don’t mind as long as the temperatures aren’t below 0! I have been sewing for the “crew” again. Upcycling polo shirts to dresses, sewing 4 short sleeve turtle necks, 4 cotton tops, etc……….. I need to kick myself to make one of my adult daughters a wrap skirt. Its cut and ready, but since its a bit tedious I find no motivation, sigh. Her birthday is fast approaching! Miss F is certainly blessed! Another adorable friend to join her and her dragon! I love it! Your heart is beautiful!! I really really love it! Visually I like that the words are not so bold. But tactically, holding it in your hand the seed beads would really increase the memory of a loved one, by feeling them. make sense? Hard to explain sometimes. Our dear neighbor fought in WWII. He lived across from us 35 years. (he owned his home over 50 years) He died 5 years ago. He was 92. I still look out the window for him. Lovely memory of your neighbour. I like the idea of the tactile nature of the beads increasing memory.I am for certain going to add beads. My that is a greadt deal of sewing you have been doing,so busy. Hope you have a good weekend and thank you for your prayers. Good to hear Mr E is home. And you have been so busy too. The unicorn is very cute! And the felt you have used for the heart is beautiful, reminds me of sunset- sunrise. Glad to hear Mr E is home. Onward and Upward! All the things you have made are lovely, especially like your first tile and amused by what might happen if you tell us how to do the pattern! Onwards and upwards indeed, we had a lovely hour sat in the garden in the sun. What a relief it much be to have Mr E home and no longer to have to do all that travelling to the hospital… you can spend the time crafting instead!! Actually it looks like you have managed to find quite a bit of time to make things this week, so your creativity is clearly returning. I’m sure Mr E must be much happier now he’s back with you – hopefully he’ll be feeling better soon. The weather here is lovely too, although it took a while for the sea mist to burn off this morning. Sadly have been stuck indoors struggling to finish a very challenging bit of editing. I have to keep reminding myself that if I don’t work I won’t be able to support my yarn habit! It is a relief not to have to do all that travelling. I can’t believe how tiring 120 miles was each day. I hope the weather stays fine so you can enjoy it too, work just does get in the way of life! 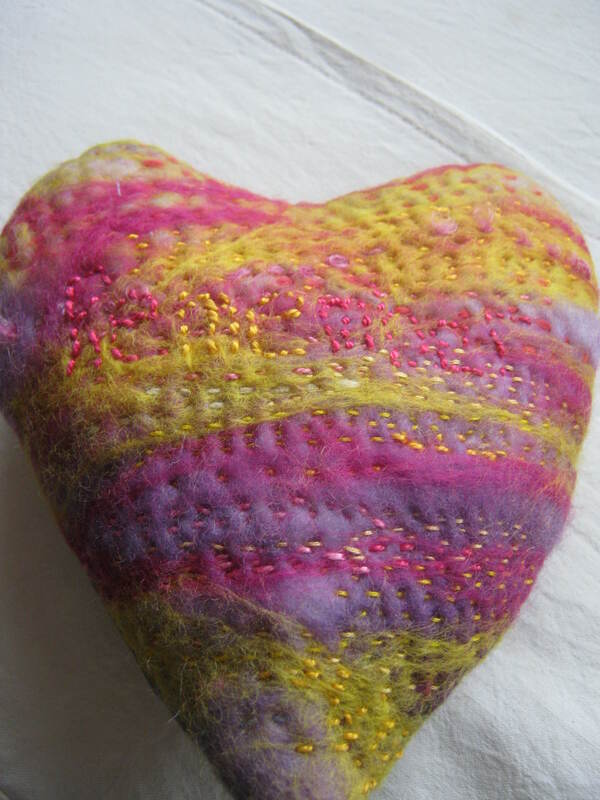 Wow, you are very busy with lots of projects on the move, I love the felted heart. You could repeat the word remember above and below going from faint to strong to indicate that the meory is still strong, not fading. Thank you- the heart is a Scarborough based project and there will be an Autumn exhibition in the Sitwells old home. The heart is beautiful, and I’m thinking that if you use a darker pink thread to create a sort of drop shadow/echo of the letters they’ll stand out better. It’s a pity to lose the message. That poem will be read out at war memorials across Australia on Wednesday next week, ANZAC day, when returned servicemen and their families assemble for the Dawn Service to remember the fallen. I read that about the poem, I understand it is well thought of in Australia. I like the idea of a drop down shadow/echo, the word is getting lost. Thank you. So much good news! Best wishes for a speedy recovery for Mr. E, as he continues to convalesce at home. Your creativity is a day brightener, so glad you are feeling it again! I like the idea of seed beads, maybe with some contrast to make the words stand out. The sunset felting is beautiful, and the poem is so poignant, made me teary! Enjoy that sunshine! We are expecting rain today, which is a welcome change; last week they were saying snow, so the upgrade is a relief! Snow to rain is good, sunshine is better. Thank you for your ideas, much apreciated. The poem is lovely isn’t it. So glad the sun is shining on you and Mr. E to lift your spirits and warm your hearts. The sawdust heart looks lovely and I’m with the majority for the seed beads. I’m just doing the border on my Eastern Jewels blanket – one and a half go-rounds to do and then I will wash it, block it and show it off on my blog. Your crosses look fine to me. I did read, on Ravelry, that some people felt a treble treble crochet stitch worked better than the double treble because it didn’t pull the surrounding crochet in so much. Too late for me to do now but, if I make it again – and I might – I would probably try that. I wondered about using a treble treble, I might try it on the next one, and I want to pay more attention to where the stitch goes round the post on the round two rows back. It does look very satisyfying as a single tile. I shall look forward to seeing yours, you have made such good progress. My son claims he brought the weather back with him from Cuba on Tuesday, I think he could be right. Long may it last. I bought the blanket as a kit and the tiles change each time. 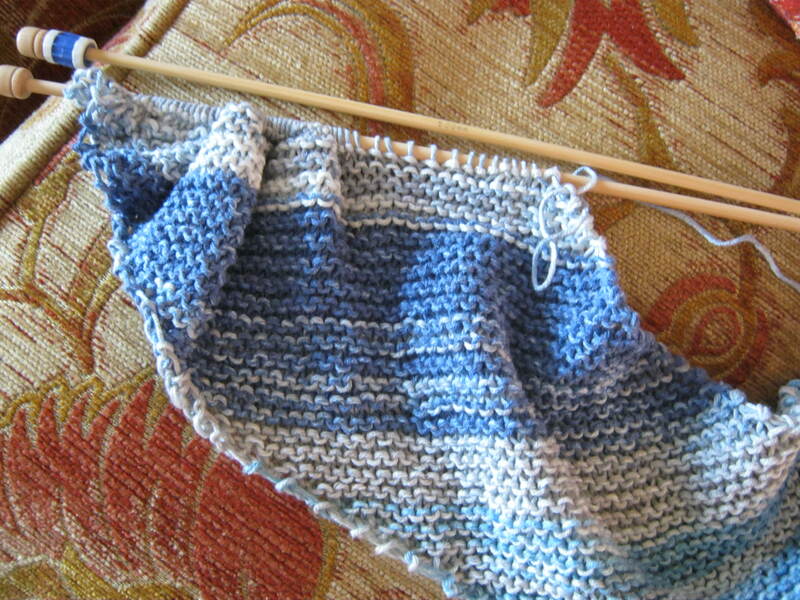 I am enjoying making it , but have to concentrate quite hard on it. I am going to try the seed beads, especially as I have quite a good selection. When the returning soldiers were making their sawdust hearts as part of their rehabilitation they used materials they had to hand, with very little actual stitching involved. I am trying to use things from my craft suplies to be in keeping with this ethos. That central verse of the poem is extraordinary, isn’t it? I can tear up just reading it. Your heart is beautiful. I think a darker thread for the words would make them stand out more, and be in keeping with the handmade look. I love your Sunday scarf, and had to laugh about the pattern. Can it be purchased on Ravelry? Thank you, The word does get lost a lot, I am pleased that everyone is confirming that for me. The scarf I bought as a kit from the Spring into Wool show, I was so surprised to see the dire warnings on the copyright given that the pattern is only two lines long and I reckon anyone could suss it out! Made me laugh too. So very glad to hear that Mr E is home and doing great – home is best in almost every way. I just love your little sawdust heart – in my opinion the words and the coloured felt are just perfect without the addition of seed beads, but I would be inclined to re-embroider the letters in a contrasting thread. Whatever, it is a real treasure. Thank you so much for your ideas. The good thing is if I try the beads and they don’t work, I can just take them out. The yellow thread seems to work better that the pinky one, I have plenty of time. I’m so pleased to know the sun is shining for you – it does perk up the spirits no end doesn’t it. I must get a wiggle on with my Sawdust Heart too. I am making it to honour my Great Uncle John who died in Memetz Wood, Somme, aged 17. I am waiting for some organic cotton material made in Wales, that has Welsh dragons on it – yes, you’ve guessed it – he was Welsh! I think seed beads to pick out your letters would be perfect. Love the sunset! That Unicorn puts a huge smile on my face – I’m sure it will do the same for all she meets! The Welsh dragon fabric sounds absolutely fabulous. How sad that Johnn was only 17. My Great Uncle Arthur was 25 , but my Grandmother always maintained he was only 18, transpired she lied about her own age and so had to knock 7 years off her younger siblings too. I shall try the seed beads, but having looked at the pciture again this morning, I am wondering about adding fragments of the word lower down, so only me remains in the end. It’s so helpful to be able to ask my fellow bloggers. And the sun is shining good and strong today. Glad to hear that Mr E is home, I’m sure he’ll have been glad to get in his own bed, I don’t think there’s anywhere better for recovery than your own home. This weather is glorious, isn’t it? I’m just hoping that this isn’t our summer and that we do actually get some sunny days later on in the year too. I think seed beads on your heart would make a lovely addition and definitely make the word stand out. Thank you. I think I shall give seed beads a try especially as I have a lot of them! I too hope for lots more days of sunshine. you have been busy & creative Cathy! the unicorn is simply adorable, little Miss F is soon going to have a bedroom full of mystical, magical creatures! And your heart is coming along nicely. Thank you Claire. It is incredible how worry can just stop you in your tracks, and how it’s removal unlocked a flood gate of activity.